The RTEX-27 has the capacity to handle a large single-family home and is perfect for high demands between multiple applications, even in colder climates. In warm climates, it can provide endless hot water for four showers and a sink simultaneously. Works great! No problem with hot water running two showers simultaneously as well as dishwasher or sink! I would recommend this. 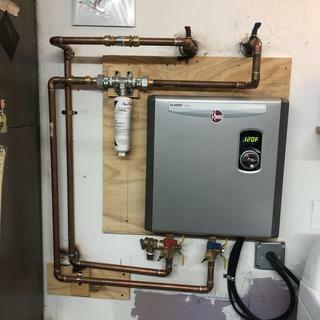 The wiring was a little more work for me because it requires 3 40 amp breakers and old water heater was just one 30 amp. So I had to make room. I have 200 amp service to my home, I was a little concerned about this unit needing 120amps but it’s working great and haven’t blown any breakers. My lights in bathroom flicker a little when I got water is first turned on for about 20-30’seconds then seems to stop. Only my bathroom though no other lights do it so I’m not sure what that’s about for sure? My wife and I love it and hope that it saves us on our electric bill? Still to early to determine since it’s only been a couple weeks that we have had it. How many breakers does this sy stem take? Where can i get the Installation instructions for rtex-27? BEST ANSWER: You can check www.rheem.com or contact the manufacturer directly at 1-866-720-2076.